Tools that track underground contaminants and speed carbon capture technology development are among the 100 most innovative scientific breakthroughs of the year, R&D Magazine has announced. The magazine named two technologies from the Department of Energy's Pacific Northwest National Laboratory at its annual R&D 100 Awards ceremony, held Nov. 3 near Washington, D.C. These honors bring PNNL's total awards received to 100 since the awards' inception in 1969. Rosemarie Truman, PNNL director of innovation impact, was also a keynote speaker at the awards ceremony. Much like medical scans, a new technology allows users to remotely look into the Earth’s subsurface in real time. Contaminants in soils often provide a high-contrast medium in comparison to clean soils. For instance, nuclear waste from weapons production is present in the groundwater and soil at certain sites across the country, posing potential threats to the environment. The contamination must not only be monitored but be better understood in order to clean it up. PNNL researchers developed and are applying Real-time Four-Dimensional Subsurface Imaging Software to determine the extent of contamination and what’s driving its migration. No other commercial subsurface modeling software constructs 3D, time-lapse images of how the subsurface environment changes over time, in real time. “Snapshots” of subsurface conditions are collected by measurements made at the surface or by electrodes inserted in boreholes that pass an electrical current through the material being studied and record how difficult it is for that electrical current to move through the material. E4D-RT combines supercomputers to analyze large amounts of data with real-time imaging and the ability to model buried metallic infrastructure – like tanks and pipes. E4D-RT is a cost-saving open source solution for imaging in many kinds of subsurface studies – including fluid movement in geothermal systems and hydraulic fracturing operations and even understanding volcanic activity. E4D-RT was developed by PNNL’s Tim Johnson. DOE’s Office of Science and Office of Environmental Management supported the technology’s development. Power plant carbon emissions could be captured with the help of more detailed information and with reduced technical risk thanks to a computational technology called the Carbon Capture Simulation Initiative, or CCSI, Toolset. 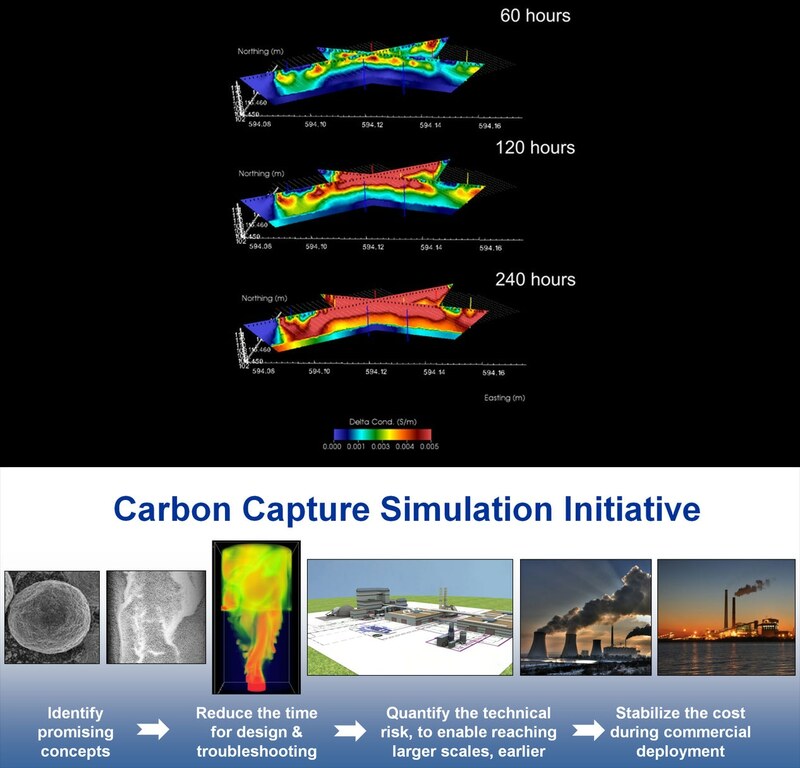 The suite of computational tools and models supports and accelerates the development, scale-up and commercialization of various post-combustion carbon-capture technologies, including solvent- and sorbent-based capture. It does so by supporting a more thorough vetting of options, complete understanding of how processes will operate at scale under relevant field conditions, and increased understanding of how uncertainty affects risk. By improving learning and reducing risk as carbon-capture technologies are being scaled up, the CCSI Toolset can reduce the time needed to commercialize these technologies and provide greater confidence for those investing in carbon capture. The technology was developed through the Carbon Capture Simulation Initiative, which was sponsored by the DOE’s Office of Fossil Energy and led by DOE’s National Energy Technology Laboratory. PNNL is one of five national laboratories involved in the initiative, along with industry and academic institutions. PNNL’s Xin Sun led a team for the initiative that co-developed the CCSI Toolset. Others involved in the tool’s development are current PNNL staff members Zhijie Xu, Kevin Lai, Varun Gupta, Chao Wang, Greg Whyatt, Feng Zheng and Charlie Freeman, as well as former PNNL staff members Emily Ryan, Avik Sarkar, Wei Xu and Wenxiao Pan.